Jon Imber created a large self-portrait on canvas in 2013. Painter Jon Imber’s death came as a shock to those who knew him and his work. Not because it wasn’t evident he was nearing the end, but because his paintings, right up until the last, were buoyant, tender, and thrumming with life, like the artist himself. 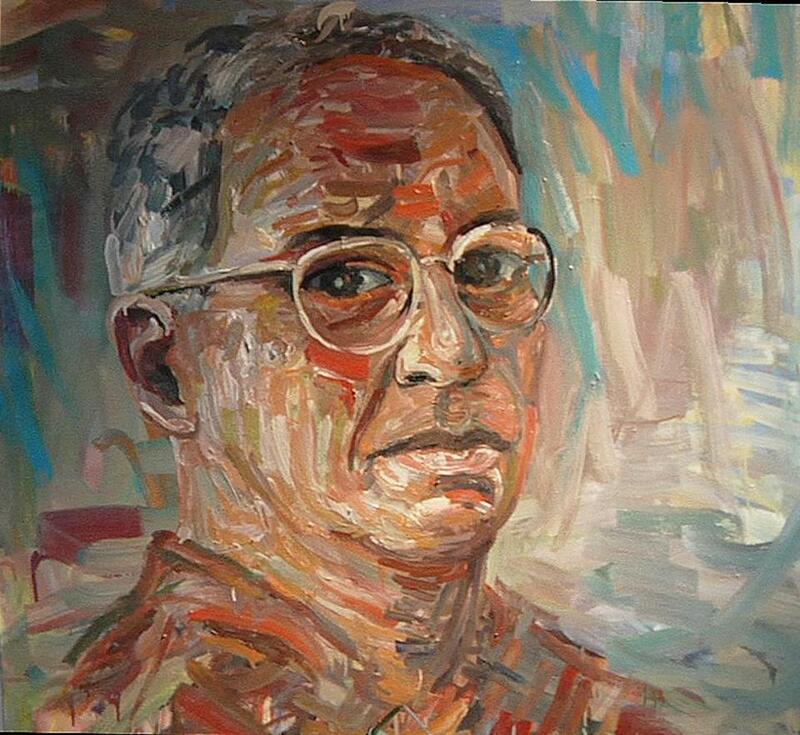 Diagnosed with amyotrophic lateral sclerosis in fall of 2012, he painted until his final days. He had lost the use of his hands and could no longer stand, but he could move his head. His assistant rigged a headset with a dowel and attachable brushes, and until the Friday before he died, Mr. Imber was painting small still lifes of flowers people brought him. “He tried to do it again on Tuesday,” said his wife, painter Jill Hoy, “but his neck seized up and he couldn’t manage it.” Mr. Imber, who taught at Harvard University for 27 years, died of ALS two days later, on April 17, in his Somerville home, Mix-It Studios, an artists’ co-op he had helped found. He was 63. “He is one of the most important painters of his generation,” said Katherine French, executive director of Danforth Art in Framingham. She placed Mr. Imber in the lineage of Boston Expressionists, those artists whose work lean on emotional content and juicy painterliness. French co-curated Mr. Imber’s mid-career retrospective at Boston University in 1999, and a new show, “Jon Imber: Carry On,” is on view at Danforth Art. His work is also in collections including the Museum of Fine Arts, Boston, and the Fogg Art Museum at Harvard. Masterful and exuberantly expressive, Mr. Imber delighted in challenging himself on canvas. He hungrily studied great artists and synthesized their lessons. With his warm, engaging demeanor and quick sense of humor, he loved a good conversation almost as much as he loved painting. In early works, he painted hulking figures with tiny strokes. 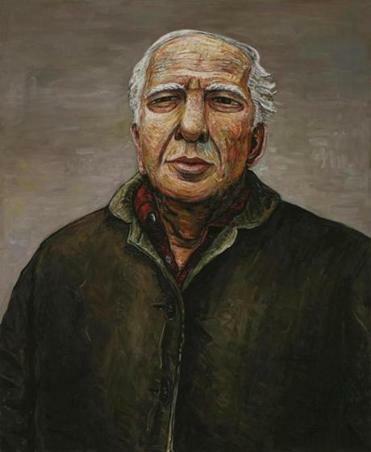 Above, his teacher at BU, Philip Guston. Mr. Imber grew up on Long Island, N.Y., and attended Cornell University. He studied with painter Philip Guston at Boston University, where he received a master’s of fine arts in 1977. In early works, he painted hulking, volumetric figures with tiny strokes. They were a strange, striking blend of Romanesque art and the blocky, cartoonish figures painted by Guston, all executed with brushy, fastidious mark-making akin to Van Gogh’s. His figure paintings, which he returned to now and again, often delved into relationships and family. Over the years, Mr. Imber’s brushstrokes grew more dashing. He and his family spent summers in Maine, and he painted landscapes there full of light and bravura gesture. Mr. Imber’s paintings grew more abstract, airier, looser, like the later works of Willem de Kooning, but they were always uniquely his own: audacious, opalescent, deeply felt, keenly investigating the limits of space. The switch from figural work to near abstract landscapes was a risk, but Mr. Imber was a painter who had to take risks to keep himself interested. “There was a tension between the observational work that was earning him a living, and an increasing need to respond to the dark horse in his life, who was always de Kooning,” said painter Philip Allen, a friend of Mr. Imber’s since boyhood. They took their first life drawing class together when they were in their early teens. Among the paintings in Mr. Imber’s March show at Alpha Gallery on Newbury Street was “I Feel Like I Am in the Middle of Swirling Energy,” a title that describes his vital approach to painting, even as he lost control of his body. When he could no longer manage the physical demands of traveling to paint landscapes, he began a series of portraits of friends, family, and anyone who passed through his home or studio: a physical therapist, a health aide. In Hoy, Mr. Imber found a partner who shared his passion for painting and understood the deep, visceral commitment an artist makes to the canvas. They met in 1991 in the Deer Isle, Maine, studio of New York painter Karl Schrag. In addition to his wife, Mr. Imber leaves a son, Gabriel of Somerville, and a sister, Vicki Solomon of Cambridge. Family and friends will celebrate Mr. Imber’s life and career on May 18 at Danforth Art in Framingham. Details will be available at www.danforthart.org after May 10. In a terrifically prolific final year, Mr. Imber had several exhibitions, a mini-renaissance that included shows at Danforth Art, Alpha Gallery, Maud Morgan Arts in Cambridge, and upcoming exhibitions at the Center for Maine Contemporary Art in Rockport, Maine, the Greenhut Galleries in Portland, Maine, and the University of New Hampshire. Despite his failing health, he showed up at openings. That enthusiasm, said Hoy, was typical of Mr. Imber. “It was part of an almost voracious desire to leave the earth with a big splash,” she said. A new film by Richard Kane, “Jon Imber’s Left Hand,” will screen at the Somerville Theatre at 12:30 p.m. Saturday as part of the Independent Film Festival Boston.